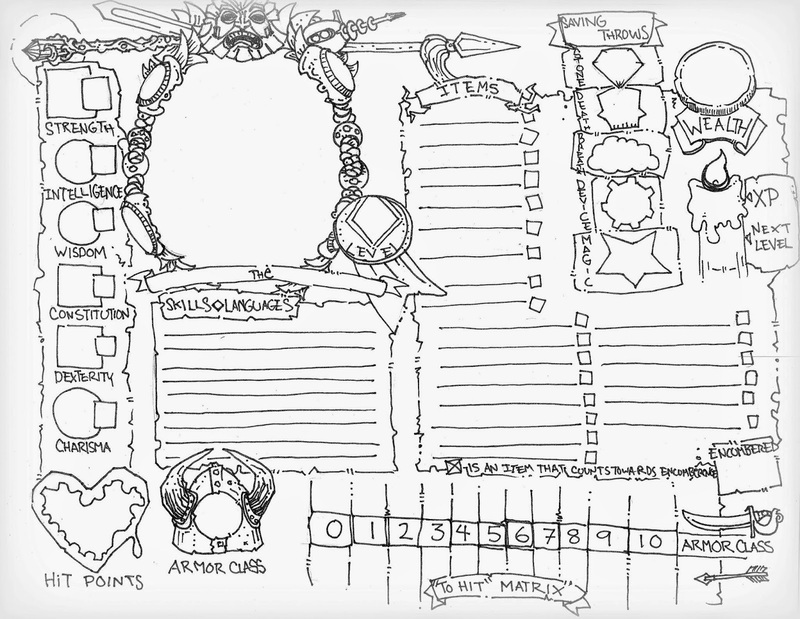 To the right is a quaint little character sheet I drew up. I suppose it's for ASE or a similar gonzo sort of game, as it includes a Zardoz head atop the character portrait, but really I think it has everything I'd need to run a basic D&D character. I made it with a 'significant item' sort of encumbrance system in mind but if you need use weights and measures who am I to say that's a bad thing. I think the hit matrix is largely unnecessary and assumes descending AC, where as I prefer a LOTFP style hit bonus system. Here's a PDF of the sheet. Below is an initial attempt to flesh out the ideas behind my fallen Empire Post of last week. 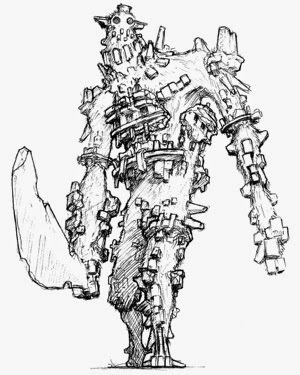 The idea behind Fallen Empire/Empire of Rag and Bone is to create a setting where high magic of the most absurd and potent variety exists, but is both rare and mysterious. I have tried to include a few setting hooks into the letter below, which may verge on “Bad wanna-be fantasy author territory” rather then game content. I also try to pull the game ideas (Stone Ships is explicitly from this world) from actual historical events (take a guess what the three below are). A while back I tried to give a fair review of Dragon’s of Despair; to express what I liked about the modules, to look at where it went wrong and to see what could be salvaged. To reiterate, the fundamental problem with the Dragonlance modules (as far as I can tell from reading two of them) is that they are story and hero driven high fantasy epics masquerading as 1st edition AD&D Modules. This isn’t to say that the story is bad, or that such epics might not make a good table top game, but it’s certainly hard to fit the epic ethos and genre conventions into a high lethality, combat adverse system like 1e AD&D or the B/X and OD&D that it derives from. 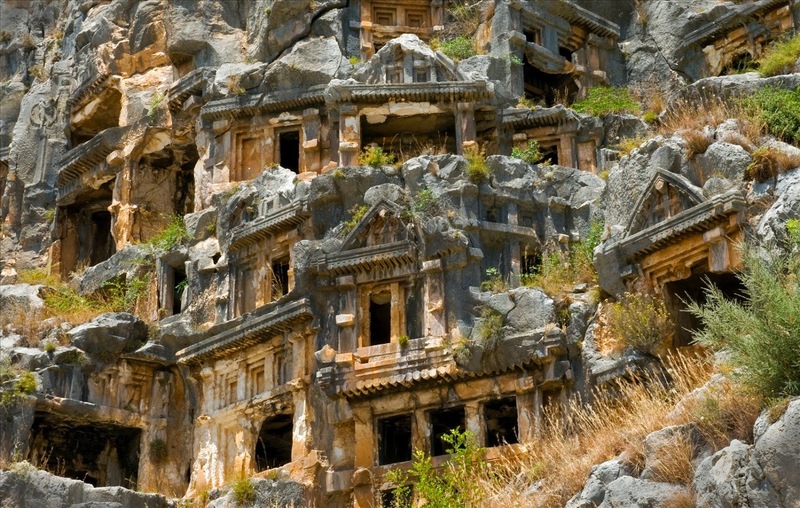 !Fantasy Apocalypse, takes an idyllic high fantasy world and reveals both its troubles and doom. !Good Enemies, The party fights dragons, and dragon men who present some fun tactical challenges. !Solid Worldbuilding, There is a sandbox under the railroad waiting to be played with many cool ideas. !Saccharine Tone, High fantasy bathos is overwhelming and painfully clichéd. !Forceful Railroading, forces player decision making and goals along a single storyline. !GM PCs, Precious little plot immune horrors that must survive to force players down the rails. !Lack of Meaningful Factions, There is bad and good, sometimes good is grumpy, but it’s very clear. Why does Dragon decor consist of Dragon skulls? 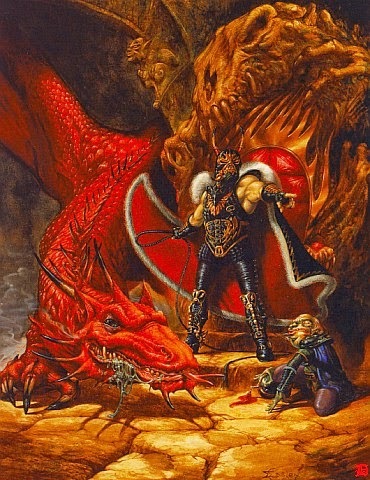 The second in the Dragonlance Series of modules Dragons of Flame was written in 1984 by Douglas Niles and continues the story right after Dragons of Despair leaves off. Player Character clerics, or at least the insufferable singing cleric Goldmoon, can now cast spells thanks to some platinum discs. Niles has an even heavier hand then Hickman at forcing the party into a series of chutes leading to heroic adventure, and he’s content to emulate the maundering pretentious language of Dragons of Despair as well. What’s worse is that while Dragons of Despair only required the railroad by necessity and encouraged the use of the novel derived pre-generated characters, Dragons of Flame actively creates all sorts of Quantum Ogre situations (events/encounters that occur regardless of PC action) and railroading while actively discouraging the use of anything but the pre-gens, some of whom “must survive”. 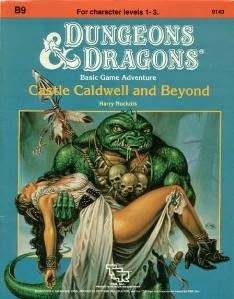 It’s not worth noting, but Castle Caldwell’s cover art is amusing, a droopy eyed lizard man carries an attractive swooning woman who is wearing an outfit straight from a mid-2000’s anti/neo-folk album cover: mini-heeled ankle boots with slouch tops, a studded girdle, some chunky jewelry and a white peasant dress. If I’d worked for Rolling Stone in 2007 a photo shoot recreating this silly scene with the folk-rock ingénue of the year would have been a personal goal. Sadly this is the best thing about Castle Caldwell. Castle Caldwell and Beyond is a bit strange, a series of small adventures designed to each be played in a few hours, rather than a larger location or set of problems to be solved over several sessions. I really enjoy this idea of module design, but Caldwell just doesn’t come together very well. It also depends on the use of boxed text, and the boxed text is terribly dull, fleshed out with the obvious and uninspiring. B9 is broken into five smallish adventures, beginning with the named Castle. There’s a lost opportunity here as only the first two of these little scenarios are tied together, while the final two are unrelated. Ultimately Caldwell is poisoned by dull writing, uninspiring map design, incomprehensible monster variety and pointless treasure. The 2014 One Page Dungeon Contest Just ended, and I spent a good amount of time this year trying to figure what to write up for it. Of the five ideas I originally had, I ended up starting PDFs of three, and then realizing that the two I liked the most wouldn’t fit on a single page. I entered a cloud castle, but am dissatisfied with it. The Kugelberg Flood is the last of these. A vanilla fantasy world one shot location/event focused on plundering the cursed pleasure dome of an ancient tyrant, now sunken beneath the sea. The party will have twelve hours to explore the place and grab what they can while the sea is at a once every ten year magical ebb. The dangers include a spectral odalisque, mad automatons, poison coral and a lot of zombie sea life. I suspect the dome could be run as a 1st level adventure, but the enemies are a bit tough for that. Perhaps it’s more appropriate for a 2nd level party. The greatest danger though is of course the return of the ocean so I think this thing would only work if one’s GM enjoyed timekeeping. My most played character of late has been Beni Profane, an OD&D (well Greyhawk) thief, who has survived in Necropraxis’ long running Vaults of Pahvelorn. The campaign is on hiatus, with the party having just slain some kind of lich and the floating ruins that have long loomed over the Vaults (a huge pit in the earth with several entrances) descending back to earth. The campaign is thus poised on the brink of either victory or destruction, as what exactly will happen next is very much an open question. Beni began as a “rat catcher” which was largely an excuse to include “sack with six rats” on his sheet. The rats have proved their usefulness, as did Beni’s faithful terrier. 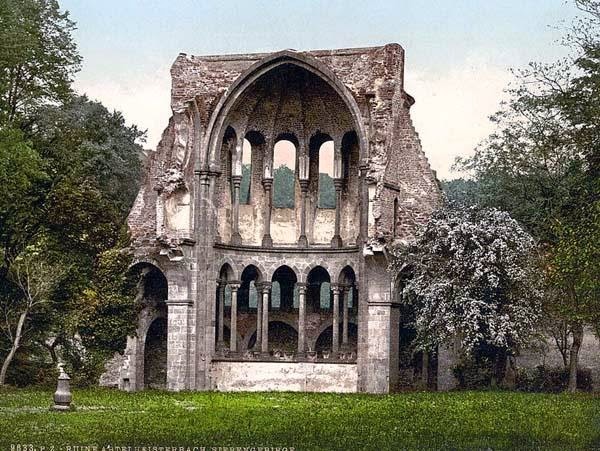 The dog died in the last session (which was almost a TPK, the survivors of a huge fireball blasted and unconscious on the floor except for one Cleric who managed to cast hold person on the lich/awakened arch mage and save the group. This is Beni’s first character sheet, with the portrait based on a woodcut from the 17th century. He has his ratting pole (with hook, dead rat and flag) and his ridiculous hat (with floral scarf and emergency/sneaking candles). So I’ve been playing Nick from Paper & Pencils’ game on his rather unique setting “Dungeon Moon” intermittently for quite a while now. The setting is a huge funhouse megadungeon, but with a better setting explanation then most. 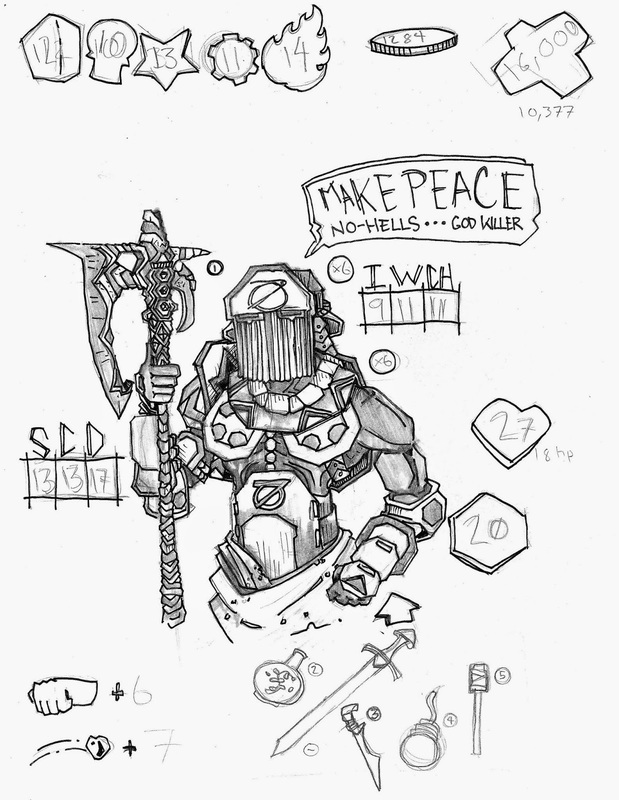 The character I originally made as a joke “Makepeace NoHells”, who I originally suggested was a “Atheist Paladin” has turned out to fit the setting quite well as a militantly atheistic warrior. Militant atheism being rather appropriate to a campaign setting where numerous extremely unpleasant demi-gods run about being nasty. Makepeace is a fourth level fighter now and wields a dangerous magical axe that slowly fills with power from killing creatures, gems on its haft glowing as it becomes stronger, until the wielder channels this power into a single huge blow. He’s a dangerous lunatic these days, having successfully slain (or at least trapped) on of the gods of the dungeon moon and returned with it to his strange cannibal cult family compound. Equipped with the finest plate armor available from the cult armory and dependent on his unnatural dexterity Makepeace has become very hard to injure, making him an effective frontline fighter and door opener. 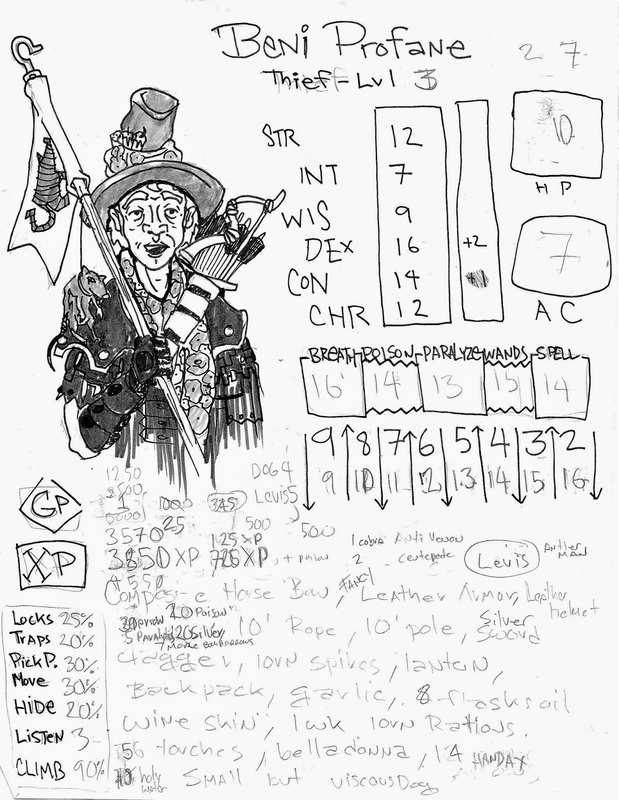 Above is the character sheet I drew of Makepeace during the last session, after Makepeace had a magically induced goblin fetus surgically removed (there are actually rules for surgically terminating demon pregnancies in LOTFP – just saying) by the party’s other fighter, Zoad the musketeer. 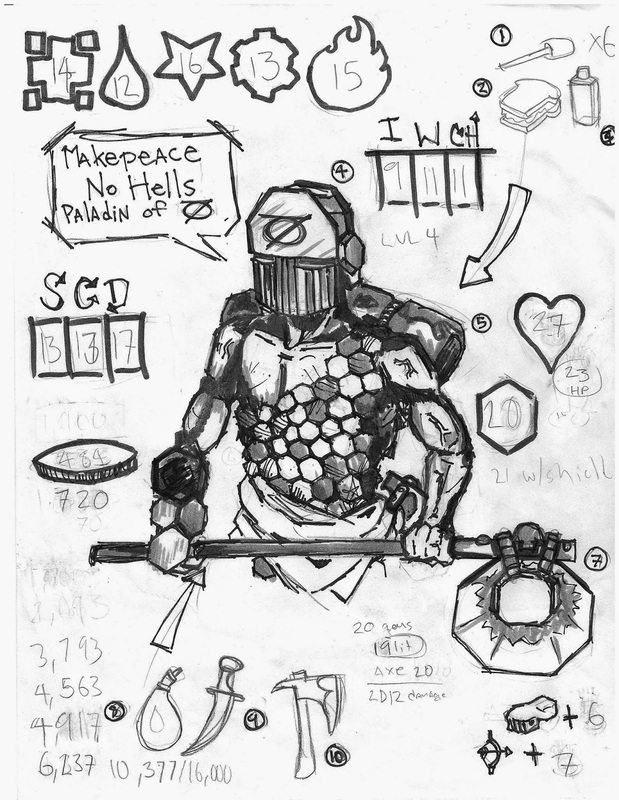 It was also recently revealed, thanks to a magical magnet trap, that the reason Makepeace constantly wears a sinister full helmet inscribed with the ‘null’ symbol denying the existence of gods (foolish really in a game where there are clearly evident, actual demi-gods roaming about) isn’t just devotion. Despite normal human intelligence and a manly enough voice, Makepeace has the grinning round face of a large baby. The product of genetics both inbred and tampered with by wizards in the last few generations has made the fighter a freak. 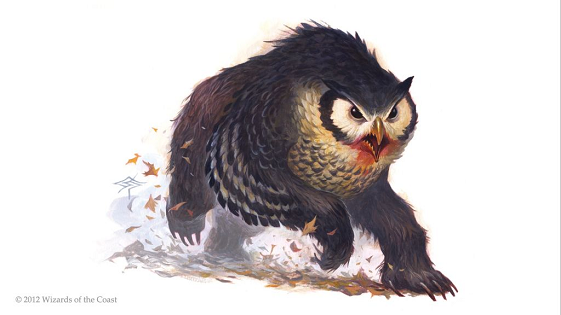 After a few adventures, when Makepeace’s party kept emerging from the tunnels under the rocky surface of the Dungeon Moon with food, valuable and glory. His family/church has allowed him to bring along one of their most promising young preachers as a henchwoman. 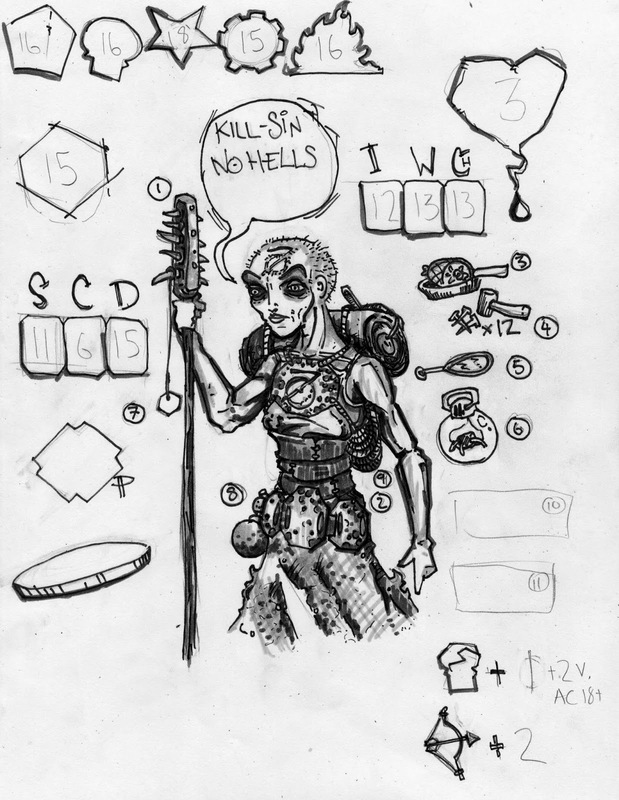 Sister-Aunt Killsin NoHells is a first level cleric of the ‘human’ spirit (though human can be switched out for whatever sentient species is currently behaving in a friendly manner). She’s been an effective henchwoman, and has used her habitually memorized ‘command’ spell to rather good effect.